Concentrate has an interesting look at the affordability of housing in the Ypsi-Arbor area. The entire article is worth a read, but I found research firm, czb's, analysis of the home and rental markets in Washtenaw County's urban core very interesting. You can read the full presentation here. Here's the tl;dr: to comfortable buy an average house in Ann Arbor you need to be making about $75,000 per year--that's about 150% of the median income. To rent an average ($1000/month) apartment in Ann Arbor affordably (less than 30% of annual income) you need to bring in about $17/hour full time. In Ypsilanti you need to be making about $44,100 per year (140% of the median income) to be able to afford an average house. To rent an average ($700) month apartmentin Ypsi, you'll need to be pulling in at least $12/hour. The concentrate article suggests reimagined development along the Washtenaw Road Corridor as a potential way to fix the supply and demand discrepancies in the Ypsi-Arbor housing market. 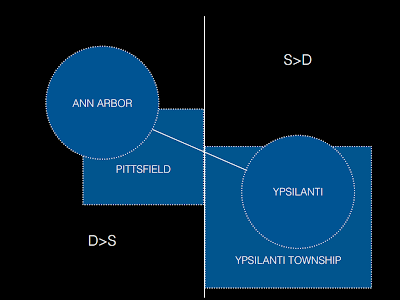 I wonder though if adding Accessory Unit Dwellings could help to add some needed capacity to the Ann Arbor market as well as potentially increasing home value in the Ypsilanti market. Gentle readers, what do you think about affordability of the area? Do you think people would take advantage of Accessory Unit Dwellings to their properties if zoning allowed it? I think I need to move back. I think reimagined development along Washtenaw could only help much if it became more walkable & more tied in with both downtowns. It's odd to think of it as an ideal place to live when it's so car and traffic dominated, without even sidewalks along the sides in many places.